Human Relief remained on site to help people in Africa. Today the situation in several African countries continues to be unstable, and the families are still struggling to feed their children and to take care for them appropriately. Human Relief finally supplies clean and drinkable water! Life has improved fundamentally for all. Millions of people could be affected by rain shortages and political instability, which makes the delivery of aid difficult. The changing security situation represents a major challenge for the work of our organization. Every year more people die from diseases, caused by impure water and lack of sanitation than by violence and war. Clean water means health, adequate food and education, especially for women and children. Human Relief has already built many water wells in Somalia, Togo, Uganda and Ghana, for the benefit of thousands of villagers. That is good news, because together we can build more water wells, which allows us a visible achievement for all people! 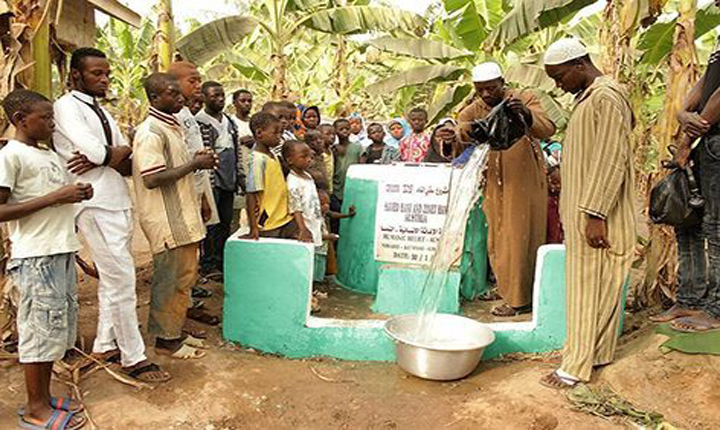 With 900 Euro for a fountain, one grants families a long-term access to clean water. Also with 1700 Euro for a powered pump with water fountain is fed an entire village.